Last time we formulated the problem of isosurface extraction and discussed some general approaches at a high level. Today, we’re going to get very specific and look at meshing in particular. 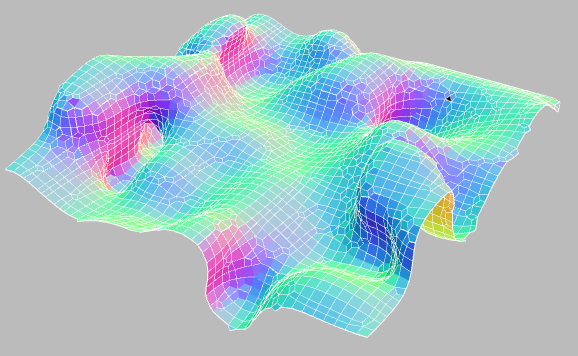 By far the most famous method for extracting isosurfaces is the marching cubes algorithm. In fact, it is so popular that the term `marching cubes’ is even more popular than the term `isosurface’ (at least according to Google)! It’s quite a feat when an algorithm becomes more popular than the problem which it solves! The history behind this method is very interesting. It was originally published back in SIGGRAPH 87, and then summarily patented by the Lorensen and Cline. This fact has caused a lot of outrage, and is been widely cited as one of the classic examples of patents hampering innovation. Fortunately, the patent on marching cubes expired back in 2005 and so today you can freely use this algorithm in the US with no fear of litigation. Also their implementation is very small and fast. It uses some clever tricks like a precalculated edge table to speed up vertex generation. It is difficult to think of any non-trivial way to improve upon it. 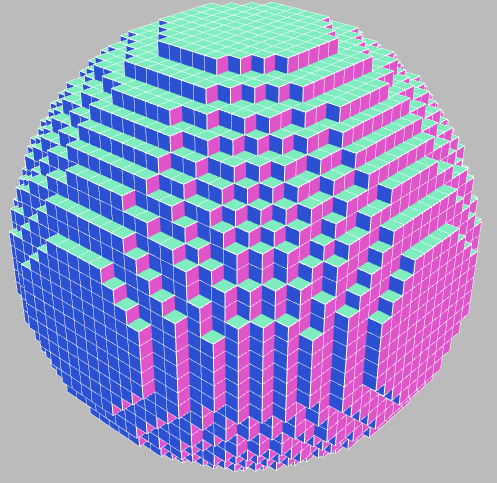 Finally, marching cubes is incredibly difficult to code from scratch. Some of the marching cubes special cases. (c) Wikipedia, created by Jean-Marie Favreau. Even worse, some of these cases are ambiguous! The only way to resolve this is to somewhat arbitrarily break the symmetry of the table based on a case-by-case analysis. What a mess! Fortunately, if you just download Bloyd/Bourke’s code, then you don’t have to worry about any of this and everything will just work. No wonder it gets used so much! Marching tetrahedra does not have ambiguous topology, unlike marching cubes. As a result, surfaces produced by marching tetrahedra are always manifold. 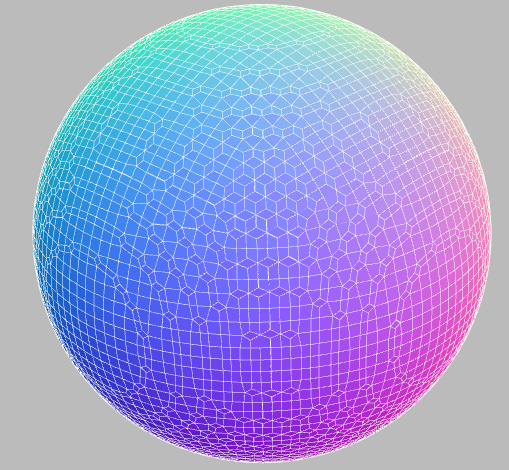 The amount of geometry generated per tetrahedra is much smaller, which might make it more suitable for use in say a geometry shader. Finally, marching tetrahedra has only cases, a number which can be further reduced to just 3 special cases by symmetry considerations. This is enough that you can work them out by hand. The general idea behind marching tetrahedra is the same as marching cubes, only it uses a tetrahedral subdivision. Again, the standard reference for practical implementation is Paul Bourke (same page as before, just scroll down a bit.) While there is a lot to like about marching tetrahedra, it does have some draw backs. In particular, the meshes you get from marching tetrahedra are typically about 4x larger than marching cubes. This makes both the algorithm and rendering about 4x slower. If your main consideration is performance, you may be better off using a cubical method. 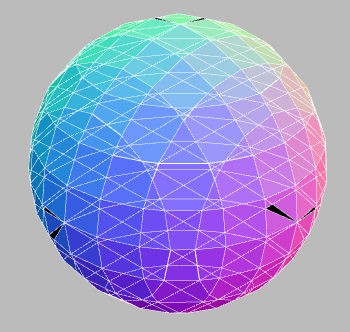 On the other hand, if you really need a manifold mesh, then marching tetrahedra could be a good option. The other nice thing is that if you are obstinate and like to code everything yourself, then marching tetrahedra may be easier since there aren’t too many cases to check. S.F. Gibson, (1999) “Constrained Elastic Surface Nets” Mitsubishi Electric Research Labs, Technical Report. 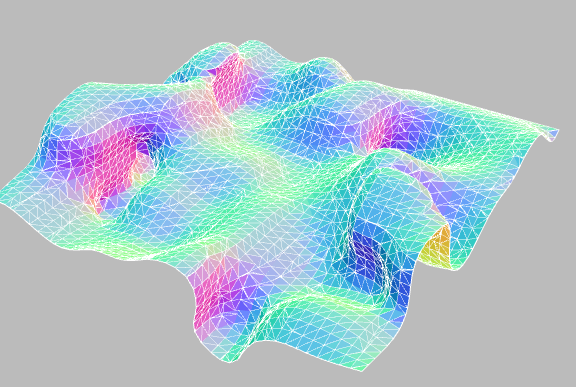 The main distinction between dual and primal methods (like marching cubes) is the way they generate surface topology. In both algorithms, we start with the same input: a volumetric mesh determined by our samples, which I shall take the liberty of calling a sample complex for lack of a better term. 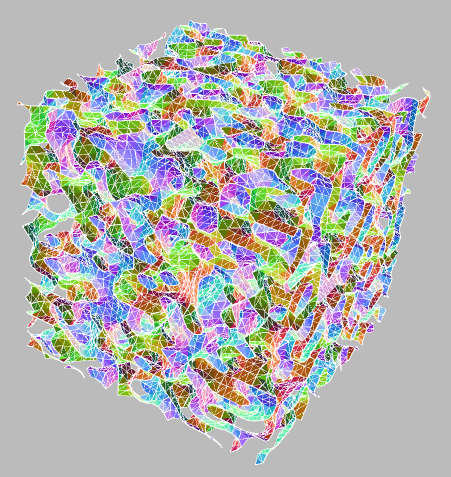 If you’ve never heard of the word cell complex before, you can think of it as an n-dimensional generalization of a triangular mesh, where the `cells’ or facets don’t have to be simplices. Here is an illustration of such a complex. I’ve drawn the vertices where the potential function is negative black, and the ones where it is positive white. Edges crossing the boundary become vertices in the isosurface mesh. 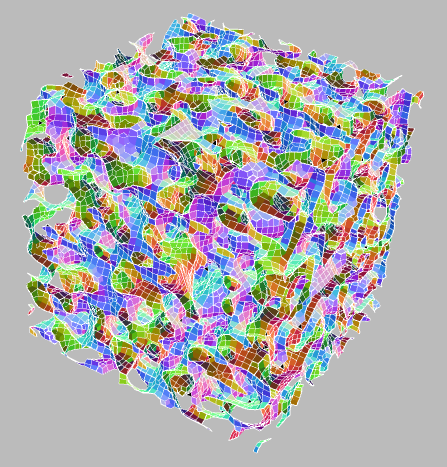 Faces crossing the boundary become edges in the isosurface mesh. n-cells crossing the boundary become (n-1)-cells in the isosurface mesh. As we have seen, these ambiguities lead to exponentially many special cases, and are generally a huge pain to deal with. For every d-dimensional cell, create an (n-d) cell. For every n-cell, create a vertex. And a rule to assign vertices to every n-cell intersecting the boundary. The second item is the tricky part, and much of the research into dual methods has focused on exploring the possibilities. It is interesting to note that this is the opposite of primal methods, where finding vertices was pretty easy, but gluing them together consistently turned out to be quite hard. Here’s a neat puzzle: what happens if we apply the dual recipe to a regular, cubical grid (like we did in marching cubes)? 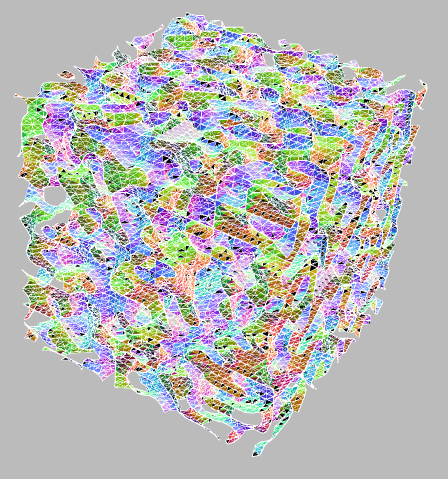 Well, it turns out that you get the same boxy, cubical meshes that you’d make in a Minecraft game (topologically speaking)! Left: A dual mesh with vertex positions snapped to integer coordinates. Right: A dual mesh with smoothed vertex positions. So if you know how to generate Minecraft meshes, then you already know how to make smooth shapes! 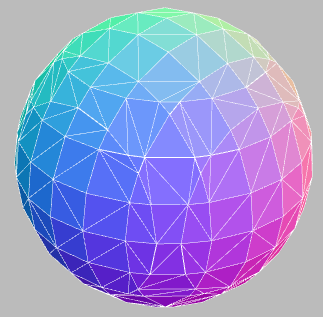 All you have to do is squish your vertices down onto the isosurface somehow. How cool is that? This technique is called “surface nets” (remember when we mentioned them before?) Of course the trick is to figure out where you place the vertices. In Gibson’s original paper, she formulated the process of vertex placement as a type of global energy minimization and applied it to arbitrary smooth functions. Starting with some initial guess for the point on the surface (usually just the center of the box), her idea is to perturb it (using gradient descent) until it eventually hits the surface somewhere. She also adds a spring energy term to keep the surface nice and globally smooth. While this idea sounds pretty good in theory, in practice it can be a bit slow, and getting the balance between the energy terms just right is not always so easy. Of course we can often do much better if we make a few assumptions about our functions. Remember how I said at the beginning that we were going to suppose that we approximated by trilinear filtering? Well, we can exploit this fact to derive an optimal placement of the vertex in each cell — without having to do any iterative root finding! In fact, if we expand out the definition of a trilinear filtered function, then we can see that the 0-set is always a hyperboloid. This suggests that if we are looking for a 0-crossings, then a good candidate would be to just pick the vertex of the hyperboloid. Left: Marching cubes. 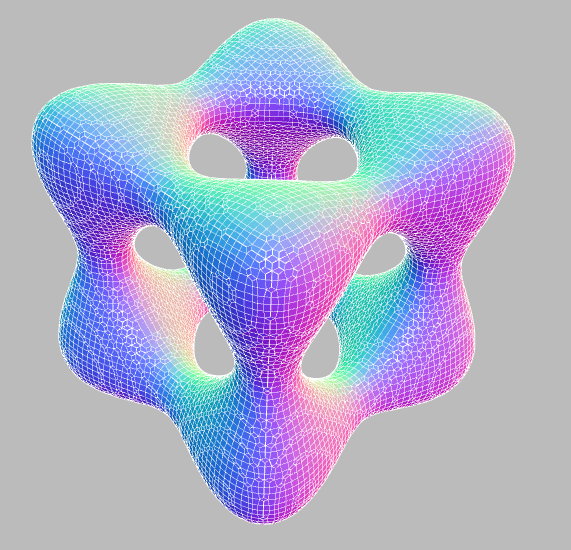 Right: Naive surface nets. 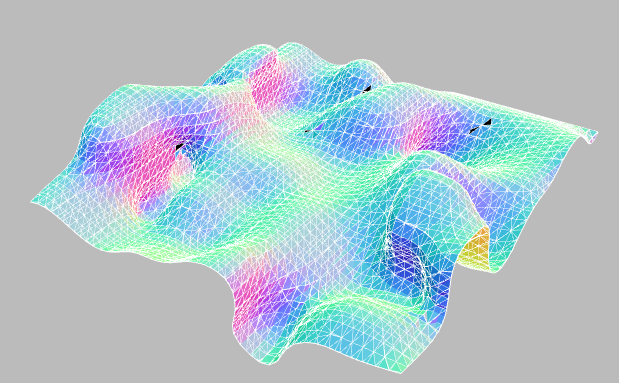 Dual contouring is a very clever solution to the problem of where to place vertices within a dual mesh. However, it makes a very big assumption. In order to use dual contouring you need to know not only the value of the potential function but also its gradient! That is, for each edge you must compute the point of intersection AND a normal direction. But if you know this much, then it is possible to reformulate the problem of finding a nice vertex as a type of linear least squares problem. This technique produces very high quality meshes that can preserve sharp features. As far as I know, it is still one of the best methods for generating high quality meshes from potential fields. Click here to try the demo in your browser! MC: 15268 verts, 7638 faces. MT: 58580 verts, 17671 faces. SN: 3816 verts, 3701 faces. MC: 1140 verts, 572 faces. MT: 4200 verts, 1272 faces. SN: 272 verts, 270 faces. MC: 80520 verts, 40276 faces. MT: 302744 verts, 91676 faces. SN: 20122 verts, 20130 faces. MC: 172705 verts, 88071 faces. MT: 639522 verts, 192966 faces. SN: 41888 verts, 40995 faces. The controls are left mouse to rotate, right mouse to pan, and middle mouse to zoom. I have no idea how this works on Macs. I decided to try something different this time and put a little timing widget so you can see how long each algorithm takes. Of course you really need to be skeptical of those numbers, since it is running in the browser and timings can fluctuate quite randomly depending on totally arbitrary outside forces. However, it does help you get something of a feel for the relative performance of each method. In the marching tetrahedra example there are frequently many black triangles. I’m not sure if this is because there is a bug in my port, or if it is a problem in three.js. It seems like the issue might be related to the fact that my implementation mixes quads and triangles in the mesh, and that three.js does not handle this situation very well. I’ve been messing around with the wordpress theme a lot lately. For whatever reason, it seems like the old one I was using would continually crash Chrome. I’ve been trying to find something nice and minimalist. Hopefully this one works out ok. Thanks for your outstanding survey of algorithms and excellent demo. Like you said, Marching Cubes has become so entrenched no one bothers thinking about alternatives. 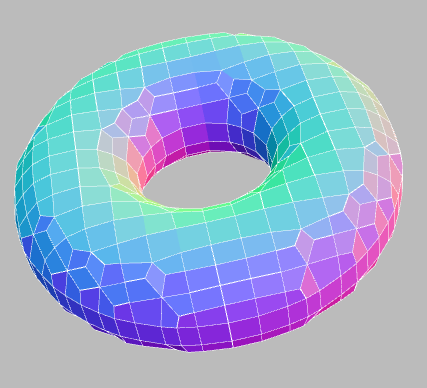 Question: Since Marching Tetrahedrons produces smooth meshes and avoids non-manifold surfaces, why can’t you just post-process the resulting mesh with a fast and conservative mesh reduction algorithm like Stan Melax’s http://dev.gameres.com/program/visual/3d/PolygonReduction.pdf (PDF)? It seems like that would create a near optimal mesh while keeping the polygon count low. jones1618: You could do that, but the naive two-step approach tends to give you a very large intermediate result, which is unfortunate because you’re just throwing most of the triangles away anyway. Worse yet, the intermediate isosurface will generally grow as the inverse-square of the smallest detail you want to capture. That’s a really neat idea! I am working on writing up something about level of detail, but I don’t know when it will be ready yet (might take a week or two). I’ll probably use this reference, if you don’t mind. It certainly has been fun watching that tiny snippet of code travel the world for so many years. Great article and great demo! Whoa! The legend himself! I’m speechless. Thank you for commenting! People keep forwarding this to me … nice article. You say “possibly the most copy-pasted code of all time”, not sure about that but I had always thought the following was the most copied/pasted code of mine, at least it has the most contributed language translations. He uses dual contouring for procedural generation of terrain and architecture, with some impressive results. Great article! 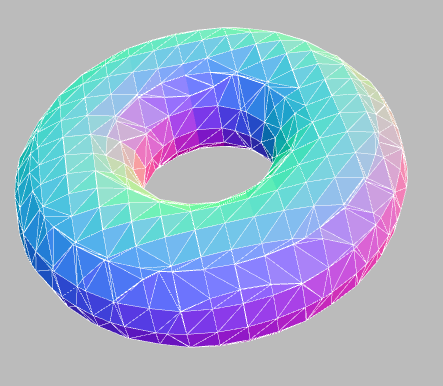 I’ve just written my own Marching Cubes routine, (and yes, I too copied Paul Bourke’s code,) but now I’m all fired up to start working on a dual contour method. Thanks for sharing your knowledge; I’ll be reading your further writings. Would surface nets with a tetrahedron grid instead of cubes generate a better mesh? The mesh might not necessarily be “better” but it would necessarily be manifold (on the other hand, if you need a manifold mesh, then maybe you would consider it better!). However, since tetrahedral subdivisions are generally more dense, you would probably end up with more vertices/faces to get the same level of accuracy as in a hexahedral subdivision. 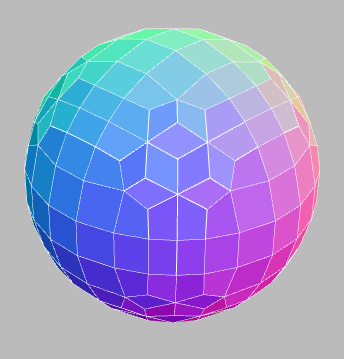 Why marching tetrahedra causes stange colored triangles on some spots? I am trying to write an implementation of surface nets in Unity using C#, but my meshes aren’t coming out quite right. The implementation I have isn’t correctly flipping faces. It’s keeping everything facing one direction. Would someone be willing to take a look at it for me? Hopefully you figured it out already. I have already made an implementation in Unity to play around with the possibility of using it in a game. If you haven’t gotten it working, let me know and I can possibly point you in the right direction. Any chance you could help me out with that? I’ve been trying for a while now.. I got cubes rendering(lolsimple), but I don’t have any idea what to do about surface nets. I’m trying to make a more realistic terrain, to use instead of the builtin 2D stuff. Hey, I’m doing the same thing and was wondering if you could help me solve some issues with making it use a dataset split into 16x16x16 (or arbitrarily sized) chunks. Nice article and approximation, AFAK there is not references for your algorithm, you should try to publish it in a journal or conference. Are you planning to finish Dual Contouring algorithm? It works nicely, but there are some weird spikes in the mesh, and I can’t figure out where they come from. I may have done a mistake in the translation, but I can’t find anything… any idea?? 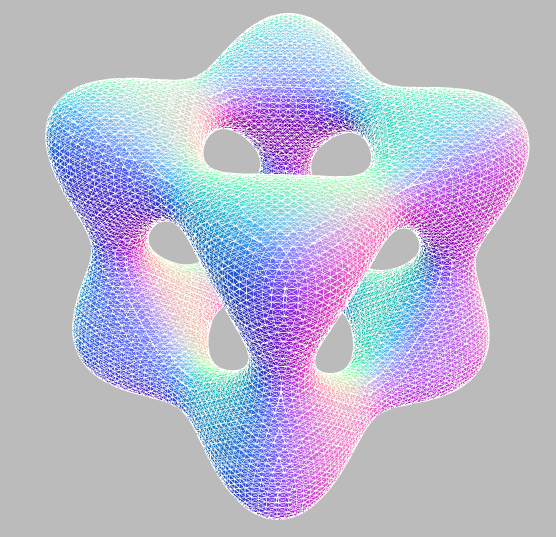 Hi guys, I want to code the Naive Surface Nets technique from scratch (in C) so I fully grasp it. After I compute the vertices on the grid cell edges (if they are zero crossings) and average them to obtain the centroid I’m left with cells that are either empty or contain a single vertex. Do I turn those single vertices in to quads so that each non-empty cell now contains a quad, or do those vertices become a vertex in the mesh ? I don’t get it. Thanks. Those vertices become the vertices in the mesh. You add a quad for each edge in the initial mesh where the is a zero crossing. Hey Mikola, really neat article. I made my own implementation of surface nets with a couple differences, but the overall result is the same. The main difference is that I do not use a signed distance field as the source of my volume, but a chunk of voxels. Since I was trying to mesh a terrain, I arrived in a really nasty problem that araises with chunked terrain. The algorithm only sees the a single chunk at a time, so at the borders it doesn’t know that there might be neighboring chunks. Because of that the final result is filled with seams between the chunks that are unmeshed. I have seen a couple of smart people trying to come up with clever solutions to this problem, but I was wondering if you have any thoughts on how to solve. Keep up the amazing blog, your articles inspired and help me get into voxels, topology and meshing, and I’m sure others feel the same! Cheers!